“SNOWBALL FIGHT!” Relive your childhood by building forts and waging epic snowball fights in VR! Unlock tools to protect your fort and deliver a fury of snowballs at your opponents! Snow Fortress is a room-scale virtual reality snow-fort building and battle game. Relive your childhood by building snow forts as you prepare for epic snowball fights! Unlock tools to protect your fort and deliver a fury of snowballs at your opponents! 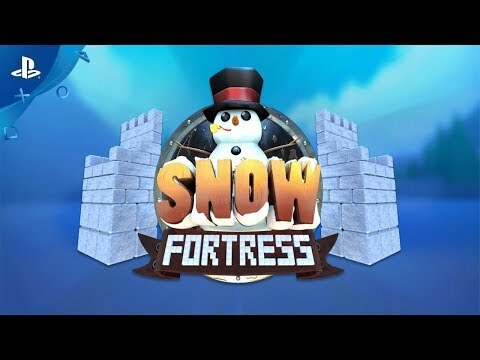 Build your snow forts and destroy the snowman's fort in 20 unique levels. Throw snowballs or use your slingshot to do some real damage. Build and maintain a fort while protecting it against waves of attacking snowmen in Survival Mode. Unlock a shield and other tools to protect yourself and your fort. Build a miniature snow fortress and defend it by placing your own snowmen on its walls. Snow Fortress is created from the ground up for Playstation®VR. It takes full advantage of tracked controllers to let you build the perfect snow fort...and then watch it get trashed by an army of angry snowmen.